Was wondering if any TST members will be attending the show this year? 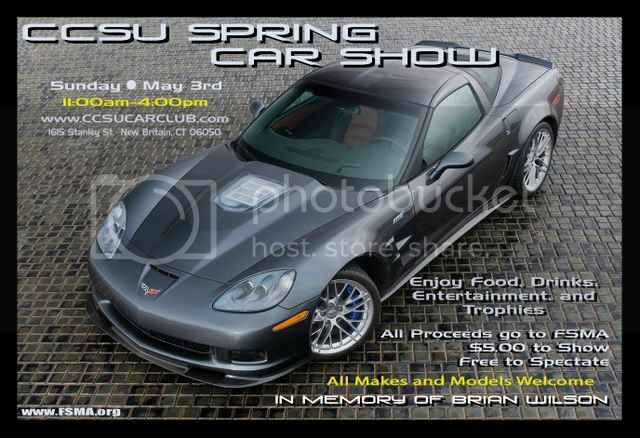 The Central Car Club would like to invite you to our 9th Annual Spring Car Show, on Sunday, May 3rd, 2009. This show will be a charity benefit for the FSMA, all proceeds will go directly to charity. - The student center will be open during the event for restrooms/vending. If you are interested in becoming a sponsor or vendor to the show please contact me for further details. Please forward any questions or comments to me on here via PM, or to the the club e-mail, ccsucarclub@gmail.com, or reply in this thread. Thanks, hope to see you guys there! Take the Rt.9 Exit 39A off I-84. Follow Rt. 9 South to the second exit, Exit 29. At bottom of ramp, take right. Go straight through first light. Follow rd, show will be on the right, signs will show which lot. Directions from I-91, Rt. 9 (Middletown, New Haven, Points S/SW/SE) From 91, take exit onto route 9 North. Take Newington exit 29. At bottom of ramp, go straight through light. Go straight through next light. Left at the next light. Road you turn onto should be Ella Grasso Blvd. Straight through next two lights, show will be on left, signs will show which lot.